Busy people often go to great lengths to fill in gaps in their diets. Even those who eat healthy want more nutrition. For both groups, products like Juice Plus seem an easy way to accomplish these goals. The Juice Plus line of dietary supplements contains concentrated vegetable and fruit juice extracts fortified with additional vitamins, minerals and other nutrients from natural sources. There are few reports of side effects, but some of the nutrients in Juice Plus may interact with medications you're taking. Most reported side effects are mild. According to a review of studies published in the Internet Journal of Nutrition and Wellness in 2013, some subjects reported gastrointestinal stress and others reported a hive-like rash. People experience stomach upset and rashes from eating certain foods, too, so this is not cause for alarm. One report of toxicity was published in The American Journal of Medicine in 2010. A 51-year-old woman undergoing chemotherapy for endometrial cancer tested high for bilirubin blood levels, indicating potential liver damage. Since no other element of her treatment or medications had changed, researchers concluded that the levels resulted from the Juice Plus supplement she began taking a short time before her treatment began. The risk of interactions with Juice Plus is also low. WebMD advises against the use of Juice Plus for people undergoing enteral nutrition and people taking quinolones. Enteral nutrition is a method of feeding, typically prescribed by a doctor, to deliver some or all of a person's nutrients. Quinolones are broad-spectrum antibiotics used to treat lower respiratory tract infections, skin infections and urinary tract infections. If you're participating in either of these treatments, check with your doctor before taking Juice Plus. The Memorial Sloan Kettering Cancer Center advises patients in cancer treatment with chemotherapy or radiation not to take Juice Plus. The antioxidants in Juice Plus may decrease the effectiveness of these treatments. A 2011 study in Skin Pharmacology and Physiology found that 12 weeks of Juice Plus supplementation increased skin microcirculation in female subjects and had positive effects on skin hydration, density and thickness. A 2007 study in The Journal of Nutrition found that trained men from a Special Forces unit who consumed Juice Plus for 28 weeks had improved indicators of oxidative stress, immunity and illness. A study in the British Journal of Nutrition in 2011 found that healthcare professionals taking Juice Plus for eight months reduced common cold symptoms by 20 percent compared to placebo. A study in Molecular Nutrition & Food Research in 2010 found that 60 days of supplementation with Juice Plus reduced inflammation in healthy adults. Many of these benefits can also be gained from eating whole food, instead of taking supplements. Juice Plus calls its products "whole food-based." Although many think the supplement is as beneficial as eating whole fruits and vegetables, it can't measure up. To fit all those foods into a little capsule, the ingredients must be processed, removing the fiber. 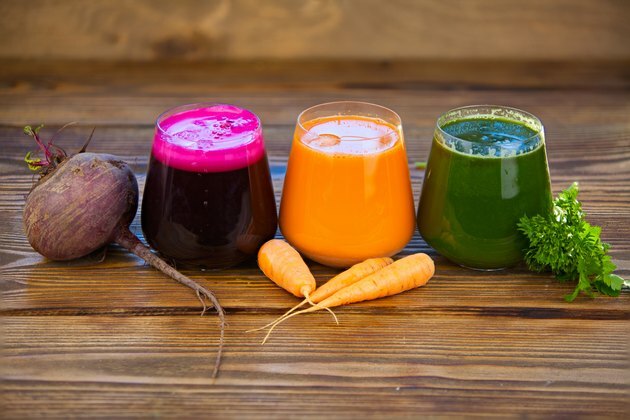 Writing in 2009, doctors Alona Pulde and Matthew Lederman, specialists in nutrition and lifestyle medicine, noted that, when the bulk is removed to process the juice, as much as 90 percent of the nutrients are also removed. In addition, the fiber in whole fruits and vegetables is an important part of a healthy diet. Fiber normalizes digestion, lowers cholesterol, controls blood sugar levels and helps with weight maintenance. If you're using Juice Plus instead of eating whole fruits and vegetables, you're missing out on lots of nutrition you need for overall health. Read more: What Are the Benefits of Juice Plus? Juice Plus: What Is Juice Plus+? WebMD: Does Juice Plus Liquid Interact With Other Medications? T. Colin Campbell: Whole Food Supplements: Is Juice Plus Good For You?